Bonita Principal Derek Bub thought he was going to be an FBI agent and still dresses like one, but he decided to become Bonita’s educational sheriff instead. 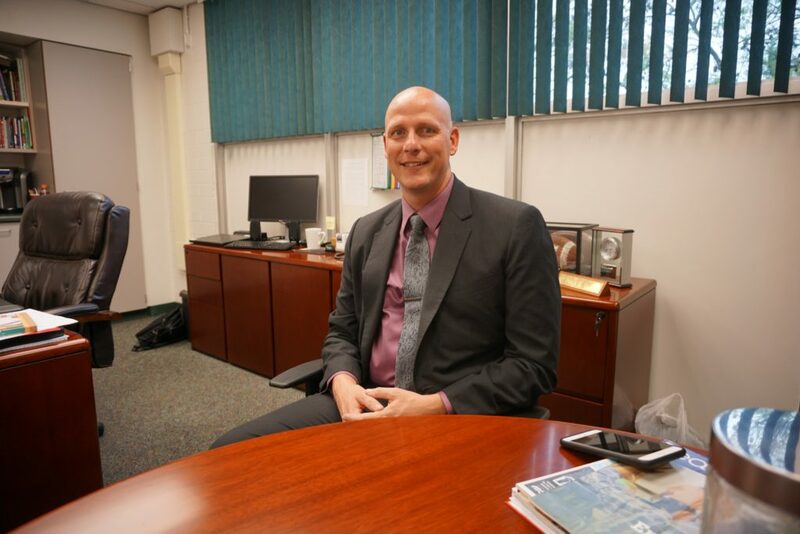 There’s a new education sheriff in town, and his name is Derek Bub, principal of Bonita High School. Actually, he took over in the fall of 2015 from the retiring Bob Ketterling who masterfully guided Bonita for 17 years as principal. In handing over his duties and responsibilities to Bub, Ketterling’s advice was succinct: “Here are the keys to the Mercedes; take care of it. From all early indications, that is exactly what Bub has done. The ex-math teacher and Chino Hills football coach who later led Chaffey Union District and Etiwanda High Schools as an assistant principal has quickly established a reputation as an innovator. If he were still donning his football coaching cap, he’d be known as a player’s coach. Instead of hiding and posturing behind his desk, he’s out on campus or in the classroom, asking teachers what they need to be successful, even if that means helping them carry out the trash. A couple of years ago, Bub was invited to Google headquarters in Mountain View, Calif., where he observed first-hand how Google engineers are re-imagining and designing the world that will exist 10 years or even a quarter century from now. In response, it’s no coincidence that Bonita offered in the fall for the first time a computer science class taught by Dr. John McGarvey. More than 200 students tried to enroll in the class. “Instead of simply offering another class, we’re trying to open doors for different groups of kids,” Bub explained. Bonita also now offers a Regional Occupation Program (ROP) video production class under the direction of Paul Eichen that produces fun, playful video vignettes of student life. Students Sadie and Anthony anchor the popular show. For a glimpse, enter “The Pawse” in the YouTube search bar. The Bearcats campus is also the home of an elite automotive technology program headed by Priscilla Englert. The STEM (science, tech, engineering and math) curriculum gives students the tools and applications they need to accelerate toward high-paying auto tech careers. Meanwhile, the longtime freshman core program has given way to APEX, an honors program that challenges students to move beyond their texts and apply their learning to real world challenges. All students in the program take biology their freshman year, which provides them with the foundation to explore more advanced science classes in their later Bonita years. In the not-too-distant future, Bub envisions all students opening laptops instead of textbooks for their daily instruction and coursework. He’s spreading his educational bets around, however, by encouraging students to participate in extracurricular activities that let them further develop their interests and passions. Some of the biggest extracurriculars on campus, of course, are the various sports programs. Earlier in his career, he saw himself as a football coach lifer whose value and tenure were tied to Friday night wins and losses that were constantly critiqued in the Saturday morning papers and blogs. Now freed from half-time, locker-room speeches to rally his team, he’s sees a bigger field that goes beyond the goal posts. He simply wants to put students (and the school’s coaches) in positions to be successful. A parent himself, with two young daughters, Bub also has empathy for over-zealous parents looking after the best interests of their children, especially when it comes to their playing time and earning a starting position. To break through to these few parents, Bub emphasizes good communications, not rants or grumblings fired off anonymously, but a face-to-face sit-down or a simple phone call. On a campus filled and fueled by 15 to 18 year-old kids, “where the 15 year olds feel like they’re 22, and the 18 year olds feel like they’re 30, and think they know everything,” the emphasis on talking things out seems to be working. Since the start of the school year, Bonita, with its roughly 2,000 students, has seen only one fight. Bonita has the systems, programs and outlets, including anonymous tip lines, for students to express themselves. Potentially explosive and intense situations are further defused, with Bub out on campus, his ear to the grounds, encouraging communication. He turns and gives them his attention. He may be the principal, but he got there by talking their language. As a result, Bonita is a Gold Ribbon School and U.S. News and World Report “Best High School (Silver) award winner. Bub’s test drive of the Mercedes has been successful, and now he’s looking to blaze new paths and take Bonita to new heights.